HOUSTON TX (July 11,2017) — Texas-based hydrocarbon and specialty gas supplier has executed a truck loading agreement with Sunoco Logistics to supply ethane from Marcus Hook, PA, not only to customers in North America but also throughout the world. Gas Innovations® announces a new venture with the start of their cryogenic ethane business. In September, Gas Innovations will provide truckload quantities of high purity cryogenic ethane from Sunoco LP in Marcus Hook, PA. Sunoco is part of the Energy Transfer LP family of companies. Gas Innovations will supply North American customers by cryogenic tankers and will provide cryogenic ISO containers for the rest of the world. Gas Innovations will fill high pressure tube trailers, ISO modules, and cylinders from this source as well at their La Porte, TX facility. North America is rich in ethane and until now, the non-pipeline and non-ship load markets have been constrained due to a lack of available and consistent supply. As more ethane is liquefied for shipping, truckload supply of ethane will be available for the many applications requiring trucks, ISO containers, and cylinders. Many of these ethane applications may require a test or demonstration prior to major investments in pipes, ships, or massive storage solutions. These temporary, portable, and short-term requirements will now have a solution with truckload supply. Gas Innovations was founded in 2002 with the goal of providing industrial gas producers and distributors a dependable, independent wholesale supply partner. Since its founding, the company has grown to become a worldwide supplier of high purity hydrocarbons, refrigerant gases and specialty gases. Gas Innovations is located in La Porte, TX. 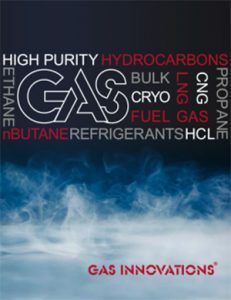 Visit us online at www.gasinnovations.com.